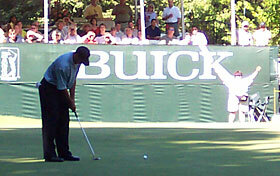 Buick Open at Warwick Hills - coverage from Friday's round (8/09/02), featuring the Tiger Woods, Mike Weir and Mark O'Meara group. These guys are good! Actually, they are more than that. 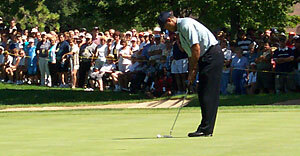 Anyone who has had the pleasure of attending a professional tournament has to be in awe, not only of the ball striking ability of players on the PGA Tour - but also of the way they conduct themselves under the pressure and scrutiny of the press and viewing public. How about hitting out of a "shoot", with the gallery f orming a line of humanity on both sides, eager to inch in as close to the action as is possible? 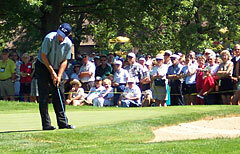 Can you imagine the concentration necessary in setting up for a shot, blocking out all the faces peering into your viewing line, and being constantly aware that photographers are zooming in, anxious for the perfect picture - sometimes ignoring the possibility that they may disrupt a golfer's shot routine? We have seen this time and again - especially during instances with Tiger Woods - who has demonstrated the uncanny knack to stop in mid-swing when an unscrupulous photographer ignores proper procedure and etiquette. This behavior is akin to failing to replace a divot, rake a green side sand trap, fix a ball mark on the green - or driving up too close to the putting surface (or even on the putting surface) with a beer in hand. Etiquette is a fine part of the game - and one that needs our constant regard. 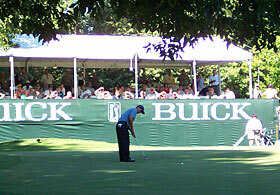 Two observations at the 2002 Buick Open - 1) Most golfing fans and members of the media are pretty well disciplined when following PGA play - 2) A few folks can spoil it for others. We need to conduct ourselves (and remind playing partners and acquaintances to likewise do so) in a way that upholds the traditions and etiquette of what many of us feel is the greatest game on earth! 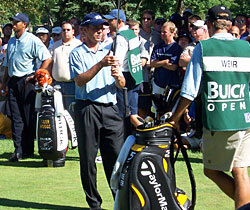 My attempt to provide coverage on the play of the trio of Tiger, Mike Weir and Mark O'Meara had its moments - sometimes humorous and at times frustrating. 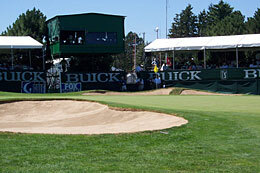 I arrived early for the 12:54 PM tee time, to find Phil Mickelson's group approaching the 18th green. Phil is not only a fine player, but is also one of the premier ambassadors for the game - always finding time to work with the media, sign autographs, and do his part to promote the integrity of the game. I will always look to photograph him at a tournament - whether he is winning or losing - class guy! Next up - attempting to find good locations to take some nice photographs - particularly of Tiger and Mike Weir together...You know USA/Canada Sparky/Tigger - that sort of thing… Tigger is a big fan of Mike Weir - the top player in Canada. Their styles are similar in that they are both left handed. You could say they are very much alike. Also Tigger is one letter away from being Tiger. But he is much easier to photograph! 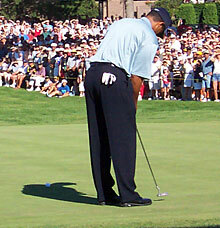 The eagle Tiger made on number 16 Friday was one of the greatest feats in golf I have personally witnessed. Tiger drove well into the rough to the right of the fairway off the 16th tee. With little room for error, he crushed the highest 245-yard two-iron I have ever seen, which somehow avoided the trees on the right, and landed softly 5 feet from the cup. We all hear about it, and watch on TV - it is something to see in person - even better than my eagle at Metro Beach last summer, which also was a two iron (from 105 yards). 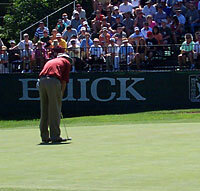 Thanks to Al Abrams and the folks at the Buick Open - yeah - even you Mr. Security Guard! Next in line for our coverage - the US Amateur at Oakland Hills beginning 8/19, and The Bell Canadian Open in Early September.